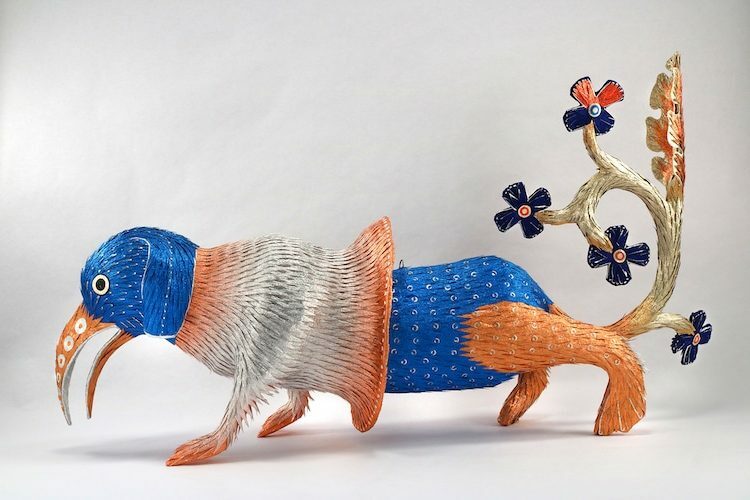 Roberto Benavidez specializes in whimsical piñata-based sculptures, many of them influenced by the surreal figures in works like Hieronymus Bosch’s Garden of Earthly Delights. His recent works are based on the peculiar figures in the Luttrell Psalter, a famous medieval manuscript. The piñata was part of life in rural southern Texas, where Benavidez grew up. In his Artist Statement, he describes himself as a “half-breed, South Texan, queer, figurative sculptor specializing in the piñata form; playing on themes of race, sexuality, art, sin, humor and beauty. His website is here.